Designer Garage Doors by Clopay & Amarr. High-End, Unique Styles! Looking For Designer Garage Doors? We sell and install the latest in designer garage doors matched with top quality Liftmaster garage door openers. Designer garage doors are part traditional and part custom overhead door all-in-one. These durable steel garage doors feature unique stamped patterns and colors to enhance the overall curb appeal of your home. Choose from many different patterns, including the appearance of real wood. Let us help you make your garage door design decisions, call 281-252-3346. 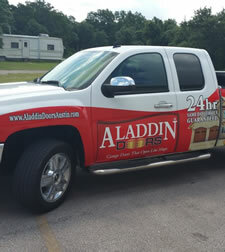 Aladdin Garage Doors is a locally-owned, full service garage door company serving the Houston area. We specialize in the sales and installation of designer style garage door systems from Amarr Doors and Clopay. One of our garage door design experts will explain the different options for you and help you choose the best door for your home. When you choose Aladdin Garage Doors Houston for your garage door installation or repair, you are getting trained technicians who care. As a small, local, family run company, we are small enough to treat you as if you were our only customer, but large enough to serve all of your garage door services needs 24/7/365. If you’d like to receive an estimate to have beautiful designer style garage doors installed on your home, shop, or building please give us a call 1281-252-3346 or fill out our contact form and someone will be get right back to you. "Mark was outstanding! Worked with my schedule."